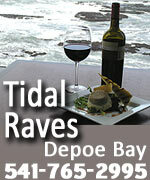 Click here for Depoe Bay specials and deals - keep checking back, as they change. An Ocean Paradise Whales Rendezvous, Depoe Bay. Two oceanfront suites as a romantic getaway. 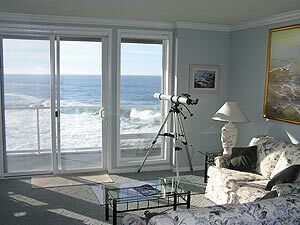 Both right on the ocean with a million dollar view of whales and waves – sitting only 50 feet above the Pacific. You get a private suite with its own private deck, each with its own private outdoor entrance. You'll have a large outdoor deck / garden area to yourself with a wood fire pit and Adirondack chairs. They even supply the wood and makings for s'mores. They offer a Vacation Rental package or a Bed and Breakfast Package: you choose. Suites come with elegant antiques, gas fireplace, fridge, microwave, toaster, coffee maker, WiFi, cozy robes, satellite TV, DVD, and binoculars to watch the whales. A large selection of DVD's. Gas fireplace, queen bed. The suites have a bathroom with pebblestone floors and cedar ceilings. 147 N. Highway 101. Depoe Bay, Oregon. 541-765-3455. Ocean Paradise Whales Rendezvous Website. 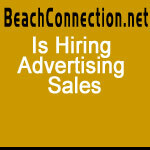 BeachCombersNW.com It's the single biggest resource for vacation rentals along the coasts of Washington and Oregon, where you can hone in on a rental home that fits any criteria, such as romantic retreats, families, pet friendly houses, large groups, ocean front, ocean views and hot tubs. BeachcombersNW includes a rental locator map, annual events calendar, seasonal specials listings, newsetter sign up, availability request forms, quick & easy rental search results, and much more. 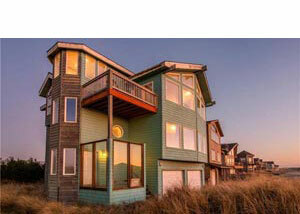 Find vacation rentals in Astoria, Warrenton, Gearhart, Seaside, Cannon Beach, Arch Cape, Manzanita, Nehalem, Wheeler, Rockaway, Garibaldi, Oceanside, Netarts, Tillamook, Tierra Del Mar, Pacific City, Neskowin, Lincoln City, Gleneden Beach, Depoe Bay, Otter Rock, Newport, South Beach, Waldport, Yachats, Heceta Beach, Florence, Dunes City and rentals all the way down to Brookings….as well as Washington towns Moclips, Pacific Beach, Copalis, Ocean Shores, Westport, North Cove, Oysterville, Nahcotta, Ocean Park, Long Beach, Seaview and Ilwaco. 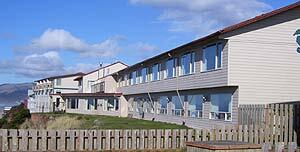 A1 Beach Rentals, Lincoln City. With over 25 vacation rental homes to choose from, They work just grand for large family vacations all the way down to a getaway lodging for two. This one breathtaking collection of craftsman or traditional beachfront homes. There are ocean view houses – from one to seven bedrooms. 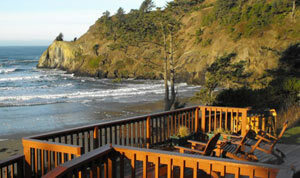 Almost all are in various areas of Lincoln City and overlooking the beach, with some in Depoe Bay. All kinds of amenities are available, like hot tubs, decks, BBQ, rock fireplaces, beamed ceilings and more. Some are new, some are historic charmers. Lincoln City, Oregon. 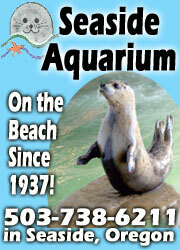 1-(503)-232-5984. www.a1beachrentals.com. Coho Oceanfront Lodge. Overlooking the Pacific; upscale, luxury hotel w/ some pet friendly. Jacuzzi, sauna, indoor heated pool, in-room massage, wifi, fitness room. Studios w/ balcony, deluxe suites for small families, couples. Suites designed for kids; big suites for larger families up to eight; fireplace suites too. Luxury suites available. Free continental breakfast. 1635 Northwest Harbor Ave. Lincoln City, Oregon. 800 848 7006. www.thecoholodge.com. D Sands Condominium Motel, Lincoln City. Every room is beachfront and comes as a suite or studio-suite and has a full-size kitchen and balcony or patio. Some gas fireplaces, all have DVD Players w/ movies. There's a heated indoor pool, a spa, and this fabulous beach is lit at night. Rooms sleep anywhere from two, four to six - including deluxe fireplace suites. Gift cards are available all year. 171 S.W. Highway 101, Lincoln City, Oregon. 800-527-3925. www.dsandsmotel.com.